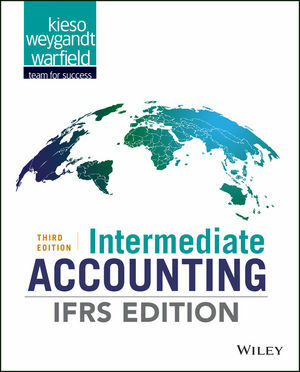 The Third Edition of Intermediate Accounting: IFRS Edition provides the tools global accounting students need to understand IFRS and how it is applied in practice. The emphasis on fair value, the proper accounting for financial instruments, and the new developments related to leasing, revenue recognition, and financial statement presentation are examined in light of current practice. Global Accounting Insights highlight the important differences that remain between IFRS and U.S. GAAP, and discuss the ongoing joint convergence efforts to resolve them. Comprehensive, up-to-date, and accurate, Intermediate Accounting: IFRS Edition includes proven pedagogical tools, designed to help students learn more effectively and to answer the changing needs of this course. Donald E. Kieso, PhD, CPA, received his bachelor's degree from Aurora University and his doctorate in accounting from the University of Illinois. He is currently the KPMG Peat Marwick Emeritus Professor of Accounting at Northern Illinois University. He has public accounting experience with Price Waterhouse & Co. and Arthur Andersen & Co. and research experience with the Research Division of the American Institute of Certified Public Accountants. He has done post doctorate work as a Visiting Scholar at the University of California at Berkeley and is a recipient of NIU's Teaching Excellence Award and four Golden Apple Teaching Awards. Professor Kieso is the author of other accounting and business books and is a member of the American Accounting Association, the American Institute of Certified Public Accountants, and the Illinois CPA Society. He is currently serving on the Board of Trustees and Executive Committee of Aurora University, as a member of the Board of Directors of Castle BancGroup Inc., and as Treasurer and Director of Valley West Community Hospital. Jerry J. Weygandt, PhD, CPA, is Arthur Andersen Alumni Professor of Accounting at the University of Wisconsin-Madison. He holds a Ph.D. in accounting from the University of Illinois. Articles by Professor Weygandt have appeared in the Accounting Review, Journal of Accounting Research, Accounting Horizons, Journal of Accountancy, and other academic and professional journals. These articles have examined such financial reporting issues as accounting for price-level adjustments, pensions, convertible securities, stock option contracts, and interim reports. Professor Weygandt is author of other accounting and financial reporting books and is a member of the American Accounting Association, the American Institute of Certified Public Accountants, and the Wisconsin Society of Certified Public Accountants. He has served on numerous committees of the American Accounting Association and as a member of the editorial board of the Accounting Review; he also has served as President and Secretary-Treasurer of the American Accounting Association. He is the recipient of the Wisconsin Institute of CPAs Outstanding Educator's Award and the Lifetime Achievement Award. In 2001 he received the American Accounting Association's Outstanding Accounting Educator Award. Terry D. Warfield, Ph.D. is associate professor of accounting at the University of Wisconsin-Madison. He received a B.S. and M.B.A from Indiana University and a Ph.D. in accounting from the University of Iowa. Professor Warfield's area of expertise is financial reporting, and prior to his academic career, he worked for five years in the banking industry. He served as the Academic Accounting Fellow in the Office of the Chief Accountant at the U.S. Securities and Exchange commission in Washington, D.C. from 1995-1996). Professor Warfield's primary research interests concern financial accounting standards and disclosure policies. He has published scholarly articles in the Accounting Review, Journal of Accounting and Economics, Research in Accounting Regulation, and Accounting Horizons, and he has served on the editorial boards of the Accounting Review, Accounting Horizons, and Issues in Accenting Education. He has served as president of the Financial Accounting and Reporting Section, the Financial Accounting Standards Committee of the American Accounting Association (Chair 1995-1996), and on the AAA-FASB Research Conference Committee. Professor Warfield has received teaching awards at both the University of Iowa and the University of Wisconsin, and he was named to the teaching Academy at the University of Wisconsin in 1995. Professor Warfield has developed and published several case studies based on his research for use in accounting classes. Theses cases have been selected for the AICPA Professor-Practitioner Case Development Program and have been published in Issues in Accounting Education. Review and Practice and Solutions: New practice opportunities with solutions are integrated throughout the textbook and the Wiley Engage course. Each textbook chapter now provides students with a Review and Practice section that includes learning objective summaries, a key term listing, and a practice problem with solution. Streamlined Learning Objectives and Design: Each chapter now offers a more focused approach within each chapter and a design that improves compatibility across all media. Authoritative Literature References: Placed near the end of each chapter, the Authoritative Literature References include a full citation as well as a practice Research Case. Major Content Revisions: In response to the changing environment, we have significantly revised several chapters. environment designed to help instructors administer their course in a personalized way. Utilizing WILEY Engage provides instructors with the online tools and resources to create and manage effective activities and assessment strategies. learning objective summaries, a list of key terms, and a practice problem and solution. Solution Walkthrough Videos: These videos provide a step-by-step walkthrough of thorough, relevant homework problems and solutions to review important concepts. Online Textbook: A complete online version of the textbook is included with seamless integration of all content. It can be fully customized, curated, or rearranged to better support the course. Local content can be easily added, including the instructor’s own assessment questions. paths, self-directed learning, competency-based learning, and more. Mobile-Ready: Wiley Engage is responsive and mobile-ready for ease of use across all devices. students stay focused and engaged. Downloadable Digital Textbook: Wiley Engage offers a downloadable digital textbook for offline reading. Additional Resources: Includes additional relevant student study tools and learning resources to ensure positive learning outcomes.